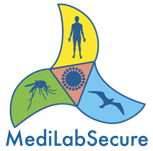 The overall objective of MediLabSecure Project is to increase, through capacity building, the health security in the Mediterranean Area and Black Sea Region by enhancing and strengthening the preparedness to common health threats and bio-safety risks at national and regional level. In particular, an integrative Network of four main disciplines, animal virologists, human virologists, entomologists and epidemiologists, from 19 non-EU countries has been established to enhance the preparedness and response to emerging arbovirosis and to improve the integration of surveillance across the involved network. Public health activities will reinforce the preparedness of the Network by investigating, and improving where possible, the standard methods of surveillance towards integrated surveillance, integrated risk assessment and early case detection in the framework of OneHealth. The strategies adopted rely also on the experience and lessons learned gained with the implementation of EpiSouth Projects http://www.episouthnetwork.org/ (2007-2014). One Health/Integrated Surveillance is the latest conceptual tool being proposed to prove the added value of the One Health concept and to ultimately reduce the risks of infectious diseases at the animal-human-ecosystem interfaces. One Health Surveillance consists of the systematic collection, validation, analysis, interpretation of data and dissemination of information collected on humans, animals and the environment to inform decisions for more effective, evidence- and system-based health interventions . Integrated surveillance can enhance the public health impact of early case detection and motivate towards integrated risk assessment that ultimately ensures human health protection. During the implementation of EpiSouth Projects, the Network created a Directory of Human Public Health and Veterinary Public Health Officials for Zoonoses in order to facilitate the surveillance of zoonosis in the Mediterranean basin in the framework of One Health. The network also identified two main recommendations towards integrated preparedness. Firstly, the establishment of formally appointed national multidisciplinary forums on zoonoses and risk assessment composed by epidemiologists, veterinarians, entomologists, laboratory officials from human public health (HPH) and veterinary public health (VPH). Secondly, the creation of a national network for preparedness and response, in line with the International Health Regulations, including the HPH and VPH authorities and all recognized actors of the process. Considering the above, the Public Health Work Package intends to reinforce the preparedness of the Network as per specific objectives, activities and outcomes reported in the table below. Dente MG, Fabiani M, Gnesotto R, Putoto G, Montagna C, Simon-Soria F,Martin de Pando C, Barboza P, Ait-Belghiti F, Kojouharova M, Vladimirova N,Vorou R, Mellou K, Thinus G, Declich S, for the EpiSouth Network . EpiSouth: anetwork for communicable disease control in the Mediterranean region and theBalkans. Euro Surveill. 2009;14(5).